Could this be the scene we see at Wrestlemania 35? On April the 7th in New Orleans, Wrestlemania 35 takes place as we all know. Often described as the biggest week of the year for WWE, there are certainly a lot of things set to happen over the course of the week. Ranging from NXT Takeover, WWE Hall of Fame, to the showcase of the immortals and the Raw and Smackdown afterwards, it is set to be a huge week for the company. At the present stage, we have two confirmed matches set in stone for Wrestlemania. Brock Lesnar versus Seth Rollins for the Universal title, and Ronda Rousey versus Charlotte Flair and possibly Becky Lynch in one on one or a triple threat match. These matches promise to deliver stellar performances if allocated the correct amount of time and have decent storytelling. The outcome of the aforementioned matches will change the whole landscape of the WWE along with the rest of the card still to be determined. One match that does stand out and has huge implications on the line is the Universal title match between Lesnar and Rollins. The implications are that Seth is the underdog in this match, going up against someone who literally is a beast in Brock Lesnar (Paul Heyman voice). Rollins needs to win the Universal Championship to bring it back permanently to Monday Night Raw away from the part-timer in Lesnar. His motivations for doing so are to give Raw a top title again, making his Shield-brother Roman Reigns proud and also to give the company the boost it needs with a full-time champ. 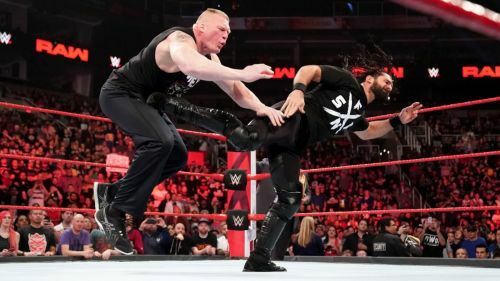 Seth certainly has a huge weight on his shoulders for his match at Wrestlemania and he knows that he will need to be at his absolute best to beat The Beast. It is admiral how Seth has stepped up to the plate in recent months with Roman Reigns' absence. He is the one guy who could do what Roman was doing but was always an afterthought, toiling away in the mid card until Roman Reigns unfortunate leukaemia revelation. Seth always had the tools and charisma both in and out of the ring to succeed but Vince opted for Reigns to be the only face and it eventually backfired on Vince as he usually had multiple top guys (i.e. Stone Cold Steve Austin and the Rock in the attitude era). WWE has the chance to finally give Seth his due to be the face of the company, something which fans would be more than happy with. The 'Kingslayer' has certainly been deserving of it for a long time, with his stellar matches and heartfelt promos. It would be a huge setback to Seth's career and WWE as a whole if they allow Lesnar to retain the title once again. One reason why that is the case is the lack of legitimate and credible opponents left for Lesnar to face. Sure you have Bobby Lashley and Drew McIntyre, but they don't seem to have a lot of momentum and credibility at the moment. WWE halted their momentum last year and Lashley barely had any in the first place after a few disastrous fueds. We sure as heck can't forget the angle with Bobby Lashley's " sisters". The WWE Universe is also not happy with Brock's part-time champ status and hasn't been for a very long time. If the WWE officials are serious about bringing change to their product, then it is essential to WWE to get Universal title off Lesnar as soon as possible and onto a full time champ. The title itself has become irrelevant on Lesnar, while others think it is cursed, going by how all the others had to relinquish it to injury. Seth is the best option WWE has to get the belt off Brock Lesnar with his superb ring work and being a fan favorite. They need to capitalise on it while the title is still salvageable or risk people losing interest in the belt altogether. Any sane person who watches WWE, would say Seth has earned the right to be the face of the company. What are your thoughts on Seth Rollins beating Brock Lesnar. Leave your comments below and thanks for reading.